New York City – January 24, 2018 – After more than half a century on the road and an unparalleled career that has redefined the cultural landscape and seen Elton John claim his place as a true global icon, the superstar today announced via an exclusive VR180 live stream on YouTube, details of his final tour called ‘Farewell Yellow Brick Road’. Tickets for initial shows listed below go on sale to the general public beginning February 2 at 10 a.m. local. 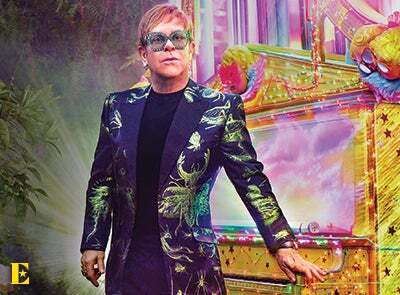 Tickets and VIP packages can be purchased at EltonJohn.com. American Express® Card Members can purchase tickets in advance in North America beginning Thursday January 25 at 10 a.m. local time, through Monday January 29 at 10 p.m. local time. A limited number of exclusive VIP Packages will also be available for sale starting Thursday January 25 at 10 a.m. local time. These exclusive offers can include premium tickets, on-stage photo opportunities at Elton John’s piano, backstage tours, limited-edition lithographs, custom merchandise and much more. The news was announced to the world in the very manner that has defined Elton and his creative output over a dazzling career - innovative, daring and constantly taking bold strides into the future. Centered around a marquee event at Gotham Hall in New York City, the announcement was live streamed globally exclusively on YouTube in VR180, and simultaneously transmitted to venues in Los Angeles and London. The immersive experience at the event - and all around the world thanks to YouTube’s VR180 technology - allowed fans to revisit some of the defining moments that set Elton on his unstoppable path to global superstardom. Transformation, after all, is part of Elton’s DNA, and he adeptly used the latest technology to help him defy space and time, connecting his past and future. Event footage along with additional 'behind the scenes' videos in VR180 tracking Elton's journey, supported by YouTube, will be available at youtube.com/eltonjohn. It was also announced at today’s launch that Gucci will be exclusively designing Elton’s ‘Farewell Yellow Brick Road’ tour wardrobe. Resplendent at Gotham Hall in a bespoke outfit, Elton discussed his passion for the Italian fashion house which last year unveiled its S/S 2018 collection - designed by Creative Director, Alessandro Michele and inspired by Elton’s inimitable style, referencing original items taken from his iconic style archives.